Creating beautiful pieces of wooden materials require creativity, patience and most importantly, a good lathe. If you’re into woodturning then a wood lathe is one of the most needed tools for you. Picking up the right tool for your crafts is quite an intimidating job. Today you are going to read our complete SHOP FOX W1704 Review. There are countless variations of the lathe from small benchtop to huge industrial ones. However, these machines significantly differ in terms of motor power, swing over bed, speed range and weight. If you’re a beginner who’s into small-scale projects then the Shop Fox W1704 by Shop Fox is the perfect match for you. Yet if you’re confused or unsure then this Shop Fox W1704 review will help you make the ultimate decision. The benchtop wood lathes are designed to meet the needs of small-scale projects or tasks. 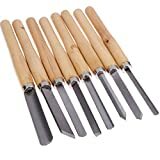 Those of you who are into DIY stuff and are keen to learn wood crafts they should opt for this machine as it is perfect to carry out small tasks. On top of that, this bad boy also has variable spindle speed and versatility to work on soft as well as a hard material. Its compact size makes it suitable for most of the workbenches. It small and easy to operate. Woodturning is a skill that requires plenty of practice on mini projects before you can migrate to the advanced ones. Hence, it will be a fantastic choice to polish your skills before you shift to a more complex machine. The Shop Fox W1704 has a dimension of 7.1 x 27.9 x 13.7 inches and weighs 45.5 pounds, which is not so much considering typical benchtop lathes. It has a very sturdy built and it can easily accommodate in any workbench. The lightweight feature makes it easy to be transferred from one workstation to the other. The Shop Fox W1704 has a sturdy and durable construction. 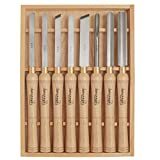 It’s made with strong cast iron that guarantees to provide satisfaction even after long hours of use for turning, cutting and other uses for small tasks. It offers a 13-cm distance between the centers and an 8-inch swing over the bed to fit different kinds of turning job. It comes with two different tool rest for 4-1/2-inches and 7-inches to add versatility to your work. It runs quietly and doesn’t have any vibration. The W1704 might not be the most powerful machine in the market. However, it can generate 700-3200 revolution per minute while turning soft or hardwood materials. 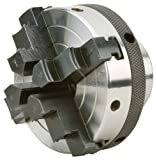 This machines also includes a 5-3/4-inch headstock spindle for non-spindle turning which is used while making circular shaped objects such as bowls as these can’t be supported from the tailstock. The spindle thread size is ¾ inch by 16 TPI. The spindle taper also uses the same Morse taper of 1 or MT 1. The power of the motor is one of the most significant features of a lathe. If the motor isn’t powerful, you will end up creating sloppy objects. The motor power for lathes generally ranges from 1/8 to 2 horsepower. Although, the most common ones are the 1/2 or 1 horsepower motors. Speed is another crucial factor for lathes. The speed is either fixed or variable. Most of the lathes have a varying speed from 500 to 3,000 revolution per minute. The variable speed can be controlled by a belt pulley, mechanical or an electrical system. 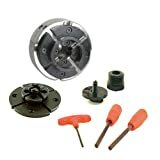 The belt pulley mechanism is used in simple and affordable models. The mechanical system is used in the mid-ranged models and it offers multiple speed adjustments, usually more than five. The electrical system is the simplest to operate and it comes with several speed adjustments. However, this feature generally comes with the expensive models. 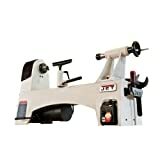 The tool rest is an important feature that lets you stop a tool even when the lathe is running to attain a flawless result as well as prevent injuries. The power switch also plays an important role. A large and easily accessible power switch will help you turn off the machine immediately if something goes wrong. Q. What power supply does this machine support? Ans: It operates on a 110V power supply. Q. Is this lathe suitable for making pens? Ans: Yes, this lathe is fine enough for making pens. Q. Does this lathe come with any warranty? Ans: Yes, it includes a 2 years warranty. Q. Does it have a variable speed or a fixed speed? Ans: The W1704 has a variable speed ranging from 700 to 3200 revolutions per minute. If you’re a crafter then you already know the impact of a good wood lathe on your projects. The Shop Fox W1704 is one of the best lathes available in the market for the crafters who are into small projects. It is super affordable and works great for the price. Even though it’s compact but it does not compromise with performance. Most importantly, it will not make a dent on your wallet. It has a superb price to performance ratio. This might not be an ideal choice for you if you’re a professional crafter. However, if you’re a beginner and doing small projects then this is absolutely a godsend for you. 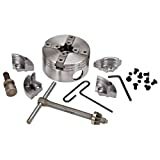 Hopefully, Shop Fox W1704 review helps your wood lathe journey.